We are specialized in producing wine racks and wine furniture. We founded the company with the objective to supply top-quality wine racks to individuals and those who work in the wine industry. Over the years, Esigo has realized a wide range of wine racks which may be custumized in terms of size and finishes. Moreover, new wine racks are regularly developed in order to meet our clients' needs and preferences. We have designed and made our wine racks. For this reason we know every aspects and features of them and we can recommend specific solutions to our customers in order to meet their needs. 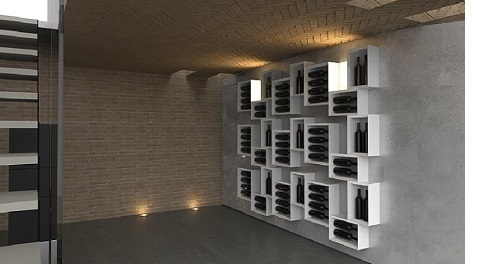 Architects, interior designers, professionals, but also wine lovers, who want to realize their wine cellar, can contact our experts for a single phase of the project or a complete consulting. Esigo provides a project manager who organizes all aspects of the project, becoming the reference for any questions, requests or consultations. Value engineering is the ability to complete a project within certain constraints of budget and space. This is the added value we give to our customers. We know the features of our products, because we have developed them in order to meet specific needs. And if we haven't already designed the wine rack which meets the requirements of our customers, we will create it with them, recommending specific options for materials and finishes to reach the desired aesthetic and technical result while restraining space and costs. Particular attention is paid to the environmental aspect. If requested, we can recommend the proper thermal insulation for air-conditioned wine rooms as well as the use of recycling materials. Esigo's customers are individuals and professionals from all over the world. We are grateful to those customers who always communicate us their emotions, their wishes, their dreams: we can consider this information and turn it into Esigo's products: classic or modern, metal, wooden or recycled cardboard wine racks...certainly you'll find a wine rack thought for you. And if it doesn't exist, we'll design it with you.